Hello and Welcome to the VVHP's The Arts of War and Peace Gallery. The works on The Arts of War and Peace Gallery are powerful in their creative energy and talent to heal and make us whole. The works can also illuminate the Vietnam veteran's journey. The Arts of War and Peace Gallery is divided into five parts. Part I is devoted to Vietnam Veterans' art work. These works may or may not be all related to war. Part II is a collection of art done by non-Vietnam veterans. Works in Section II are related generally to war in some way. Some of these works are modern, as with veteran Tom Maloney, while other works are those of the classic masters, such Goya and Picasso. There is also a work done by the Vietnamese artist, Choe. Section III contains a collaboration of the work of American and Vietnamese artists to create a set of murals for a new landmine education center built by PeaceTrees Vietnam in Dong Ha (Quang Tri Province). This effort is headed up by artist Lee Lee. The works shown here were created by a group of Vietnamese children who live in the city of Dong Ha. Jim Gensheirmer graciously allowed us to show some of his photographs from his book: Pain and Grace: A Journey Through Vietnam. Section IV shows a few of Mr. Gensheimer eloquent, beautiful, and sometimes disturbing photographs. There is a link to where you can buy his book. Section V belongs to Richard Lennon's "Requiem - The Vietnam Collection." "The exhibition, 'Requiem  The Vietnam Collection', paid tribute to all 135 photojournalists, from all sides of the conflict, who died or went missing during the war in Vietnam and neighboring countries" to quote a small part of an article available in Section V.
In each section, when you click on an artist's name, you will be taken to that artist's page. On the individual artist's page will be thumbnails of all his or her works. These thumbnails are hyper-links, meaning that by clicking on them, you will be able to see the work in a larger format. Bookmark this page, and come back often to view the changes and additions. Your comments to the artists would be much appreciated. Enjoy your visit. Section I. Vietnam Veterans' Arts of War and Peace. Section II. Non-Vietnam Vets' Arts of War and Peace. also pro and anti-war, and propaganda art, perhaps. others to have a section here? The Vietnam War website. Lot of Tim Page's photos, history of Vietnam conflict and more. 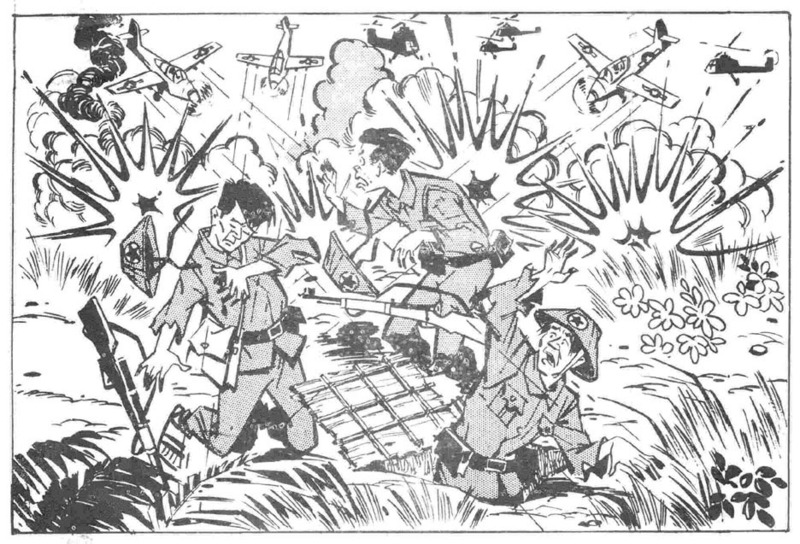 Here are two of the Propaganda Leaflets encouraging surrender of NVA and VC forces that were dropped by the tens of thousands by allied aircraft throughout Vietnam during the 1960s and 70s. Exact artistic development information is not currently known. We would appreciate any information others might care to share for posting. These two copies were submitted by Harry N. Adams, Australia. 1. 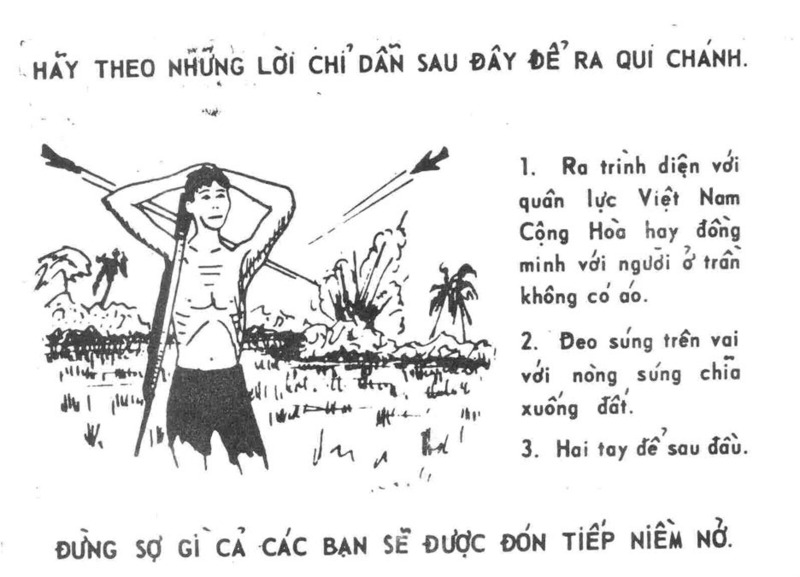 Go out and present yourself to the Vietnam Republic Force, or be alienated with those who are half-naked. 2. Carry your Gun on your shoulder with the Barrel pointed to the ground. 3. Place your hands behind your head.